One of the highlights of our trip was our afternoon spent at Marcelo Batata Cooking Class with Chef Ebelin. 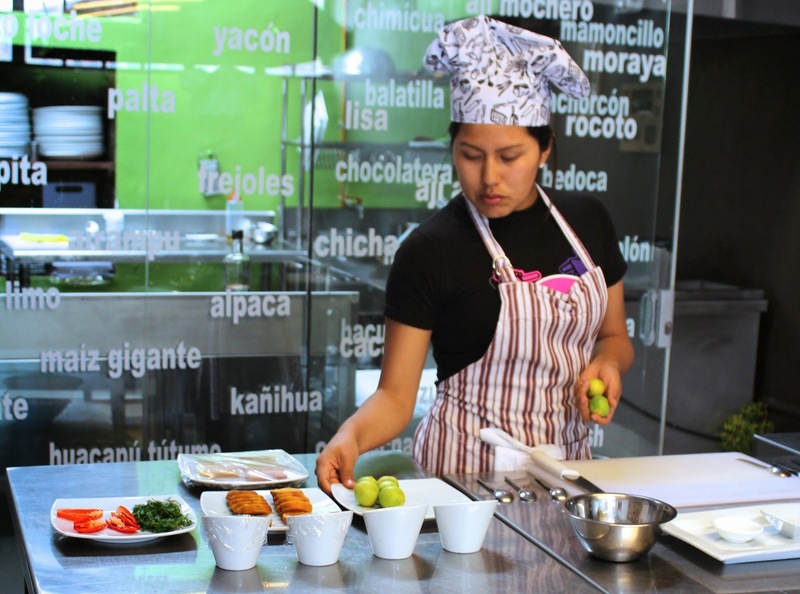 I looooooove food, and when I saw a cooking class on my friend's old Peru itinerary I had to add it to ours too. The special room for learning about Peruvian ingredients! Throughout the class, the restaurant brought us little bites of hors d'oeuvres, including delicious ceviche, a popular offering in Peru. Next, we had a fruit tasting, focused on native fruits that Americans don't see every day. 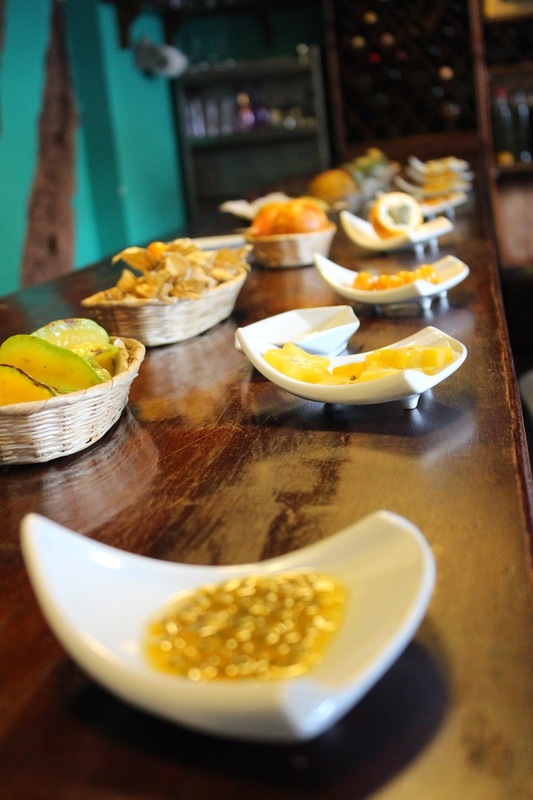 We tried aguaymanto, tumbo, and passion fruits, and more. The weirdest one to me was lucuma, which tasted kind of caramel-y! Not like a fruit at all, which means it's a great healthy sweetener that can be used in ice cream and other things. After enjoying our appetizer, we then went into a history of pisco, a brandy famous in the region. We tasted three varieties of pisco (woo! It's like sipping vodka or something, a clear liquor around 40% ABV) and then learned to make two cocktails: pisco sour, and chilcano. I really liked that Ebelin incorporated some creatively-infused piscos; it made me want to infuse alcohol back home! After getting sufficiently tipsy on pisco, I got to play with fire. Kidding! 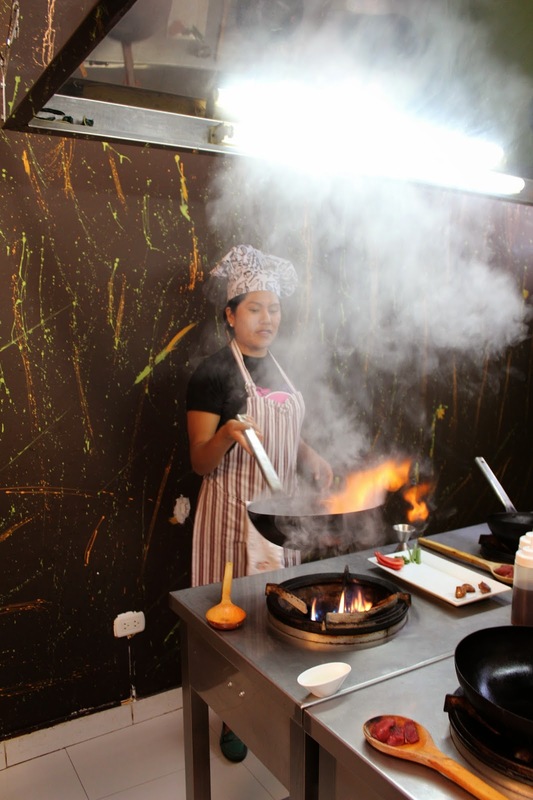 But there were flames and smoke, as we kicked off our main event: alpaca saltado. We'd been eating lomo saltado during our trip, and this stir-fry version replaced the beef with alpaca. Alpaca is very lean, and low-fat... it's kind of the perfect red meat without the unhealthy stuff. Ebelin demonstrated the technique for us first. Then, it was our turn! Ebelin gave us each step, and we made our own stir-fry. The climactic moment was when we tossed some pisco into the pan, creating big flames for effect. Overall, I had a lot of fun with the wok. I wasn't as good at flipping stuff in it as Dan, but I had a good time nonetheless. We plated up the alpaca saltado with the requisite fries and rice, then headed to the dining room to eat it. Our dessert was prepared for us, a death by chocolate platter with truffle, mousse, and molten cake. Incredible. I ate soooo much throughout this class. You don't really need to eat anything beforehand, because you basically never stop eating. (I didn't even include photos of everything we ate, because I was too busy stuffing my face to take photos.) It was such a cool experience! I really enjoyed getting to know Peru's gastronomy via the class, and I'm glad we were able to spend the afternoon learning from Ebelin.